I’ve finally started work in earnest on a new picture book after a much needed break from children’s books. Now and then I’ll post some of my exploratory sketches. For now, project details will be a bit on the sparse side but I’ll try to make up for it with drawings instead. The first stages in my illustration process involve reading the manuscript, breaking down the pages, making notes about the content, the themes and references in the text and then pulling as much visual material as I can. And if I can shoot my own reference, I do as much of that as possible. Because I feel I need to know as much about what the book means as what the book’s subject and setting looks like, I do as much reading research as possible. If the book references myths, I’ll read as much as I can about them. This research part helps me establish the illustration concept – the possible sub story my illustrations could tell while they’re also supporting the text. Then I arrive at the first sketch phase. I jot down really rough scribbly composition explorations to begin to establish the feeling of the book, the movement and to chip away at the concept. I’m not systematic in my initial approach and early thumbnails are often spread throughout several sketchbooks, on numerous loose pieces of paper throughout the studio and in whatever notebook I happen to have on hand. I also start spending a lot of time trying to figure out illustrations and the medium in my head. There are certain technical constraints to consider and these influence medium, final art size and approach. I think about this when I’m out for a walk, shopping, cooking, trying to get to sleep or at other inconvenient times during the day and night. This part of the process can go on for a long time. There is often quite a bit of time between when I’m given a manuscript and when I’ve been contracted. Sometimes months. And that time is used to work stuff out in my head and for me, it’s a necessary part of the process. I add to an inspiration file during this time – inspiration might come in the form of magazine clippings with clothing examples, fabric samples with colours or patterns I find intriguing and I want to work into the final artwork or postcards that evoke a feeling or mood that suits a page I have in mind etc. Sometimes, I never revisit these clippings. Mostly their influence on the artwork is incredibly obscure. But they help to awaken little pathways in my brain and lead me off to much needed solutions when I get stuck or disenchanted with what I’m working on. When I’m ready to start drawing, I’ll often jump back and forth between hacking away at early compositions and text placements and studies of specific subjects that will appear in the illustration. It’s easier to solve a composition if all I have to think about is subject placement and not how to draw that stuff I’m putting in there. It eliminates all the little frustrations and leaves me to focus on and solve the big picture. I’m at this stage right now – the exploration of individual elements. I like this stage. It helps me loosen up my drawing and learn to love it again. 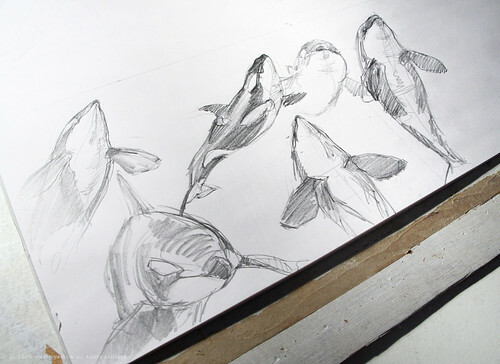 Already I’m better acquainted with the shapes of killer whales – where their spines flex, where the curves and slopes and indentations in their bodies are – and all this will allow me to move away from a strict reliance of available reference in the future drawing stages and pose the animals in a way that suits the illustration. My approach to the process is never exactly the same with every book. Though it is generally exactly the same. I jump back and forth between steps as it suits me. I go back to the very beginning if things aren’t working out. I’ll come at it sideways if I’ve reached a point of stagnation. But by having a way of breaking down and beginning at the beginning of a book project – one that may become quite complicated, depending on the text – it makes the thing a lot less overwhelming and much more manageable. Find the entire archive of illustration process posts, in order of oldest to newest, here. related: illustrated versions of my general children’s book illustration process. < why do they call them trailers if they come at the beginning of the book? The whales are beautiful. The one in the bottom left looks like he’s going to swim off the page.